A couple of months ago I went a bit crazy on Nabla cosmetics‘ website and this is the result. 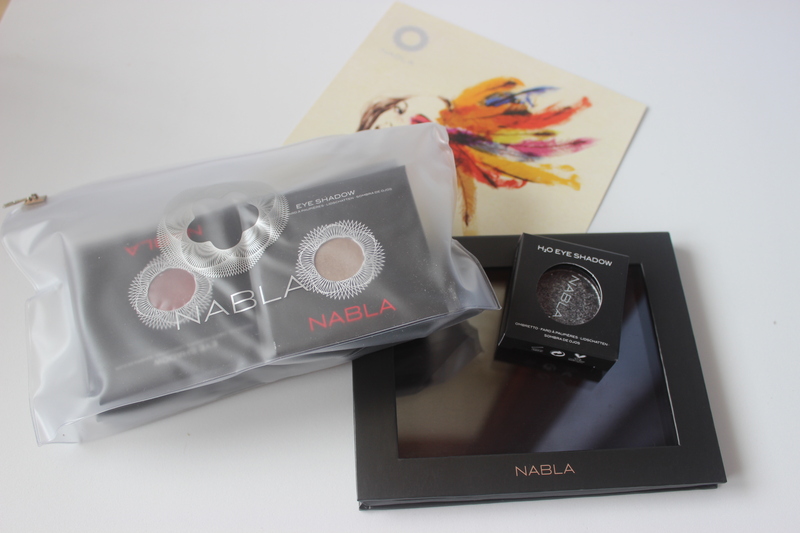 If you don’t know who Nabla are, they are a small Italian makeup company that took the net by storm last year on this side of the Mediterranean. Right now they offer different kinds of products: eye shadows, lipsticks, mascara, etc, but what really drew me in was the fact that the eye shadows could be bought as refills and the fact that they are 6,50€ each. At the time of my purchase there was an offer going on, so I got the 12 pan palette for free when buying 12 shades. The palette can be found on their website at 10€. I also received the translucent make up bag above, which retails for 2,90€ on their website. As an introduction to the brand, I am going to review the four shades that I got from their Genesis collection. 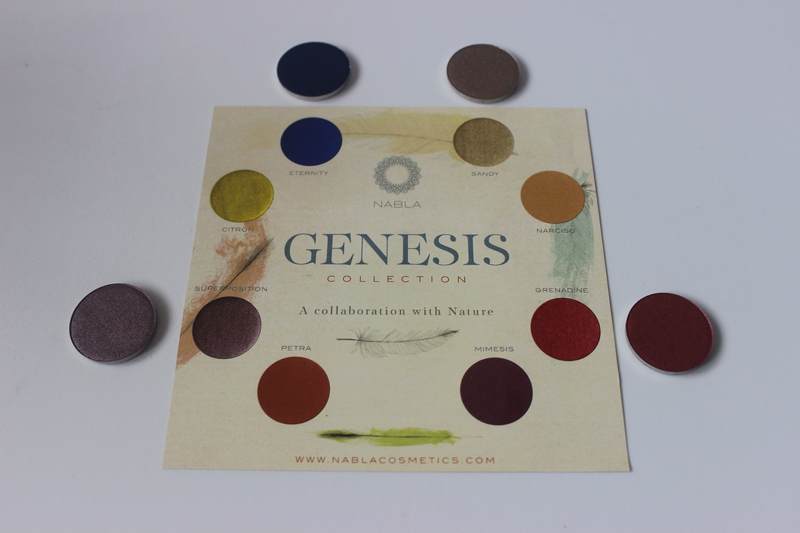 As you can see above I choose four of their Genesis collection eyeshadows, the ones that I was personally most drawn to. Eternity: this is a gorgeous intense blue. Nabla describe it as a “Prussian blue with sapphire shimmer. Bright.” As you can see in the swatch below it is a very pigmented eye shadow and I love it to bits. Superposition: this shade is not currently available as it has been substituted by Ground State, which is very similar. Superposition is a “Superposition è un duochrome di base nocciola con riflesso lavanda violaceo” (sorry only found the Italian description) which means that it is a duochrome shade with a hazelnut base and a lavender-purplish reflection. Grenadine: this shade is a stunning reddish shade with a rose or fuchsia reflection. Nabla describe it as “Pomegranate red with amaranth shimmer. Satin.” and I swear I had to google amaranth! 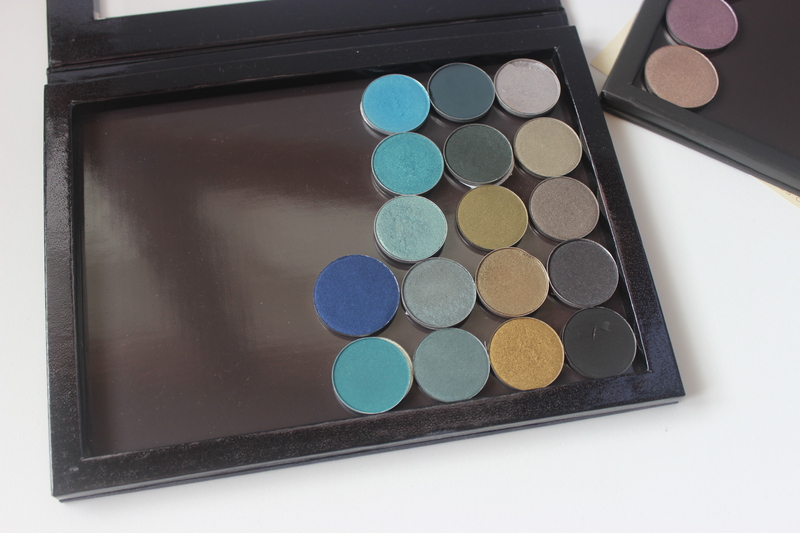 Above you can see that 12 eye shadows fit easily in the 12 pan palette. They also have a 6 pan palette available for 6,00€. 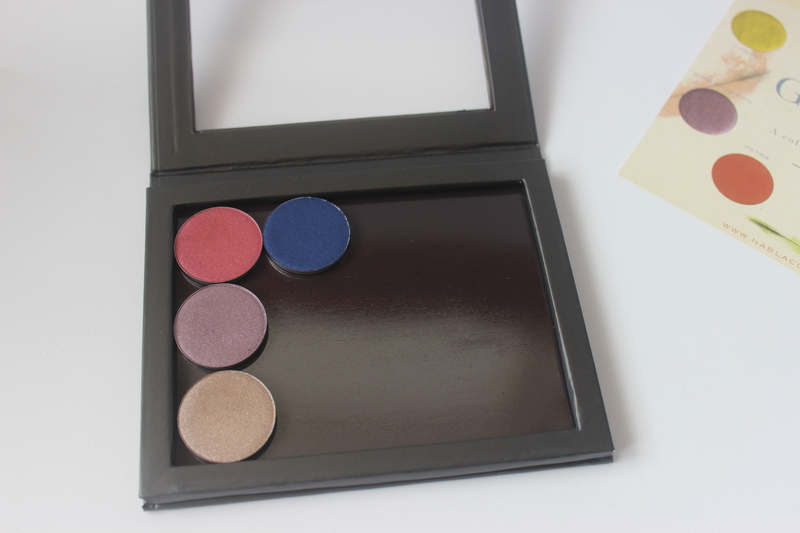 The palette has a very similar design to the z palettes: it is made of cardboard and it has a magnetic closure. 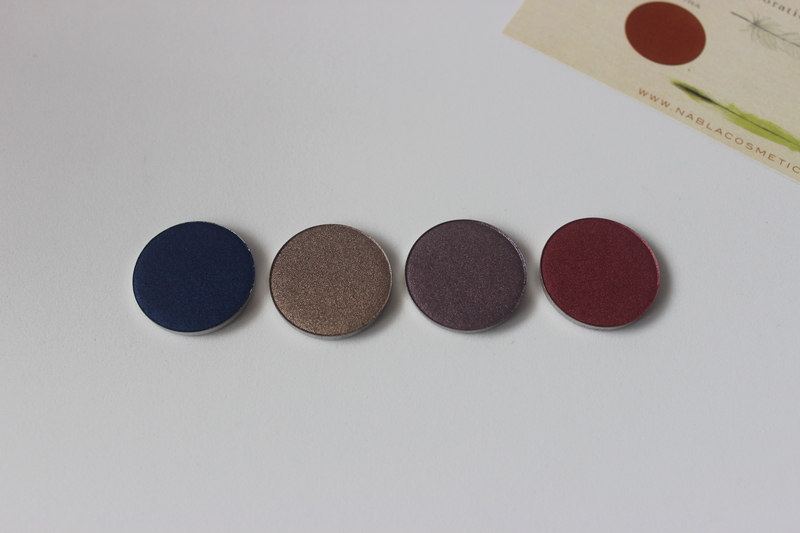 As for the quality of the eyeshadows, I must say that I am really impressed. 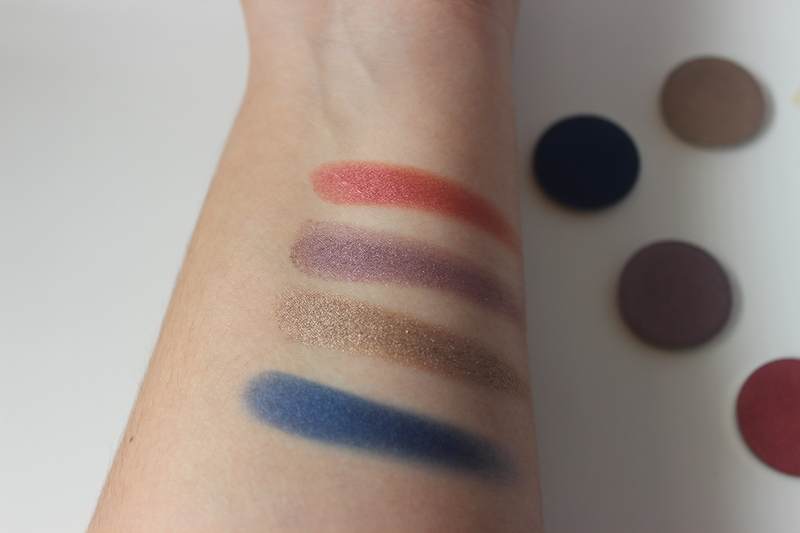 While it is true that it seems that it is easier to formulate shimmer shades than mattes and that these four are on the shimmery side, I really liked how pigmented they were and how smooth their application was. Sandy in particular felt specially creamy. As for the size of the pans, they are an intermediate size between a regular Mac eye shadow and a Pro Longwear eye shadow (see picture above). According to this blogger they contain 2.5g though I have not found the information on the packaging or the website. Personally, I love that a brand with such quality is easily accessible from within Europe, which means no potential extra cost at customs. So tempting! Had you heard about the brand before? I have never heard of this brand before, but the color look amazing. I’m happy to see new cosmetics brands formulating products with integrity. After I write this comment, I’m off to discover Nabla–I only wish I knew about this brand sooner–my sister just left for Italy and I made her promise to bring back some Kiko 🙂 Great review and selection of colors. And finally, yay for Kiko products! What did you ask your sister to bring you back?